For most wastewater and sanitary system cleaning jobs, it takes several minutes for sewer cleaner operators to lift additional debris tubes off the racks, maneuver the truck’s boom and clamp the tubes into place – a process that can lead to operator fatigue. 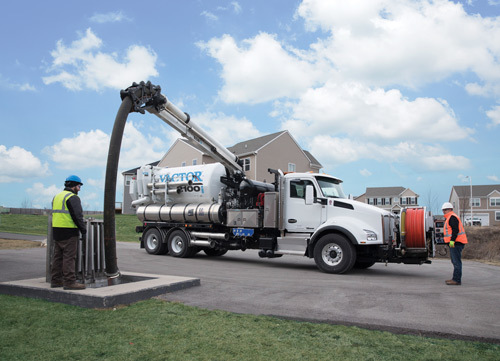 To improve this time-consuming process, Vactor Manufacturing introduced the Vactor RDB 1015™ rapid deployment boom as an option for the company’s 2100 Series combination sewer cleaners, which include the Vactor 2100i and 2100 Plus trucks. Designed in Vactor’s research and development facility and proven in the field, the patent-pending boom telescopes 10 feet out and extends the debris hose an additional 15 feet down for faster cleaning of catch basins, manholes and lift stations. The rapid deployment boom’s ability to extend and retract 15 feet of vacuum hose drastically reduces – and in most cases, completely eliminates – the set-up and tear-down time required to assemble additional debris tubes. The boom can also maintain a lower profile, which allows the combination sewer cleaner to clear low overhead obstacles and still reach needed depths. The RDB 1015 boom can stow with the catch basin tube attached on the truck, making it even easier to begin work immediately. Public works professionals and others involved in cleaning and maintaining sewers and catch basins recognize Vactor as the first name in sewer cleaners. Vactor 2100 Series combination sewer cleaners are the preferred products by many operators for both their intuitive design and ease of use. For more than 50 years, Vactor Manufacturing has been an industry leader in combination sewer cleaners featuring innovative technology, design advantages and customized solutions that drive productivity, enhance operator performance and safety, and deliver greater economy and efficiency.